A & S are a Steel fabrication company specialising in architectural metalwork, construction metalwork , steelwork and steel fabrications. 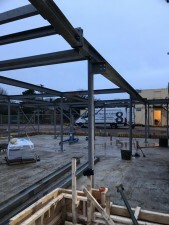 Steel fabrications from our factory in Birmingham form a large part of our turnover, tubular steel fabrications, solid surface steel fabrications, and structural steel fabrications. Our architectural metalwork includes but is not limited too Staircases; Balustrades & handrails; Gates & Railings; Structural steelwork: Bar & counter tops; Over bar and back bar metalwork; Bespoke door furniture. In addition to this we manufacture on a supply only basis many varied items including Brackets, Hoppers, Stillages, Bollards, Trip rails, Glass storage racks and much more.... including Brass,Copper and aluminium. Installation thoughout the UK including many projects in London. Contact us by telephone, email or by fax. Ask us to visit and meet with you. Our employees are highly skilled and have many years experience and all are fully trained and qualified in all aspects of the plant and equipment used by each of them. Health and safety training is paramount at A & S and every effort is made to keep our employees fully trained and upto date with the current legislation. All site staff are CSCS trained as a minimum with some holding SMSTS certificates and all holding current abestos awareness qualifications. SUPPLY ONLY or SUPPLY & INSTALLATION of bespoke steel fabrications throughout the UK including many projects in London.